via Bite Back: “We claim responsibility for the attack on the National Parks and Wildlife Service on the morning of Thursday 18th September. NPWS were targeted for their part in the war on wildlife, with an extended history, and a continuing habit of dumping 1080 poison (sodium fluoroacetate) into wild places, all under the public guise of ‘conservation’. Killing and destroying indiscriminately, how many more lives and lands must be destroyed by this groups insane, ecocidal visions and experiments? To express our outrage, under the cover of night, we entered their depot on Darug/Gundungurra Country (Blackheath, NSW). During our short visit, two vehicles were set upon leaving tyres slashed, windscreens smashed and a little additive into the fuel, just to sweeten the deal. If you choose to continue to use this land as your dumping ground, you will encounter us again. Our rage will only burn bigger and stronger. In defense of predators. In defense of wildness. 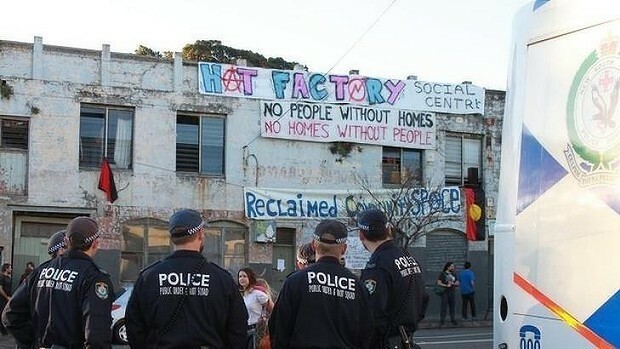 26 September: The battle over the derelict Newtown squat that sold for $1.725 million last weekend has broken into a bitter war of words, with inflammatory messages from both sides posted throughout the building. 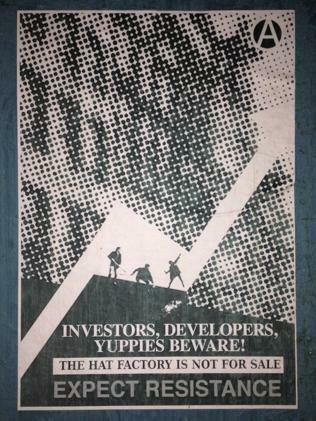 Warnings aimed at the new owners have been spray-painted across the facade with the words “Be careful what you bid for” and “Yuppies, developers, investors beware”. 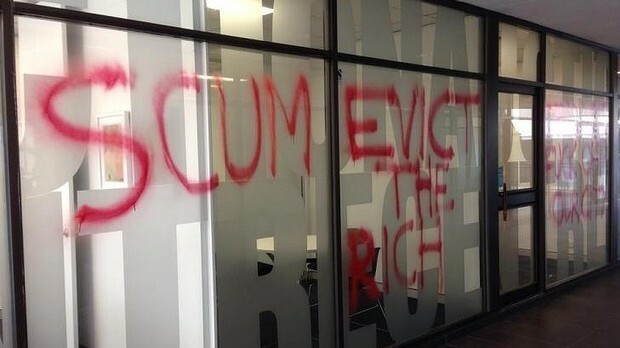 23 September: At some stage on Saturday night or early Sunday morning “Evict the rich” and “Developers f— off our city” were spray-painted across the windows of Cooley Auctions headquarters in Double Bay. The locks of the office were also filled with super glue. 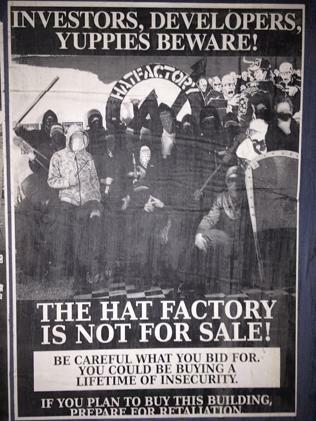 Damien Cooley, from Cooley Auctions suggested the incident could be related to the scheduled auction of 164-166 Wilson Street, Newtown, a warehouse in Newtown that had been used as a long-running squat. It sold for $1,725,000 under the hammer. 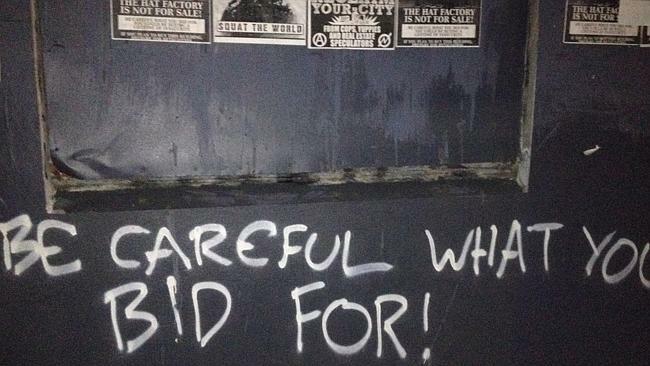 “As well as spray-painting all sorts of colourful words they also spray-painted a symbol,” Mr Cooley said of the vandals. He said the symbol, an O with a zig-zag through the middle, also featured on a banner that appeared outside the Newtown squat. 16 September: They had stocked the kitchen with food, hauled in crate-loads of belongings and even brought their tortoiseshell cat. The small group of 20-somethings left the Argyle Place property about midday after being ordered out by police. The Argyle Place property “is being prepared for sale”, officials said. 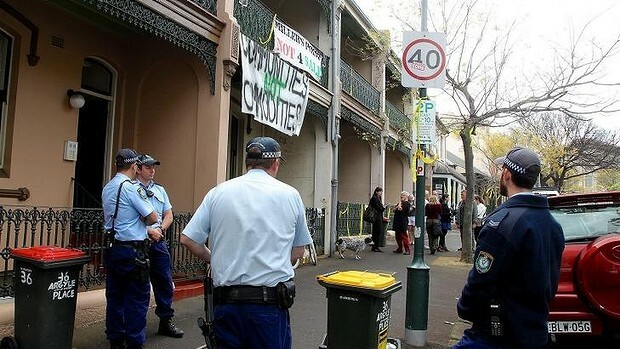 Banners draped from the balcony read “Millers Point Not 4 Sale” and “Communities Not Commodities”. Tayce, a 27-year-old squatter who declined to give her last name, said the eviction was a “farce”. “I’m homeless – there are so many people on the waiting list for [public] housing and this house was empty for two years,” she said. “There is nothing wrong with the house, it’s beautiful. I don’t think houses should be sitting empty.” The house was connected to electricity and, despite a bit of mould, was otherwise “amazing”, Tayce said. About four squatters had occupied the terrace house after finding the back door unlocked and the property empty. Squatters are also known to be occupying other homes in the area.